Of all the pets you would expect a toddler to be playing with, this is most certainly not one of them. You’d think that most kids would play with building blocks or train sets, but one toddler decided that his 'toy' of choice would be a gigantic python, and his folks seem okay with it. The first thing I thought to myself when I saw the video footage was, 'you shouldn’t be doing that', and wanted to get into the video and pull the kid away from the massive snake! According to UNILAD, the footage was captured in East Java Province, Indonesia. 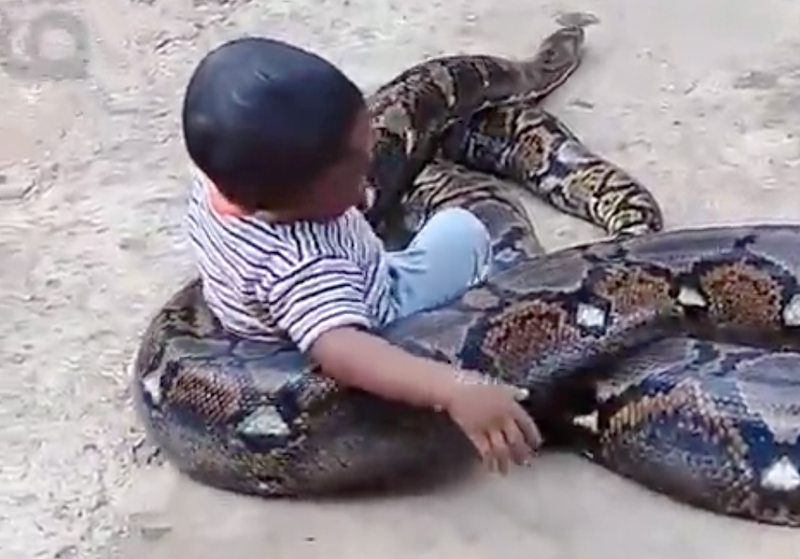 This kid, probably about three or four years of age, was seen having the time of his life with the python, utterly unaware of how dangerous the enormous snake can be. Read: Can you spot the snake hiding in this image? The little one rests his head on the python and at one point even picks the snake's huge head up. It looked like a day out at the beach for this toddler who had the most joyous time with a creature that would normally petrify most grown humans. Personally, I think building blocks are the better option here as a toy for this kid, but who knows, he may become the smallest snake handler in the world?